It was another dismal week for Netflix. The stock dropped 35% after announcing that they lost 800,000 subscribers and projecting that fourth-quarter earnings would be below expectations. Henry Blodget (Business Insider) says: Sorry, but this Netflix collapse is overdone. HP announced that it will keep it’s PC division but there was speculation that they would shut down the webOS division. The head of HP’s PC division this was an unfounded rumor. Google announced an update to Google TV and there were rumors of a Siri-powered, integrated Apple TV coming in 2013. The New York Times published a very touching eulogy of Steve Jobs written by his sister Mona Simpson. A must-read. Death didn’t happen to Steve, he achieved it. People aren’t happy about Google’s plans to discontinue the social features of Google Reader. Flipboard, the popular news/social reader application for tablets, is about to get some competition from Google (Propeller) and Yahoo (Livestand). Benchmark-backed Nextdoor launches a private social network for neighborhoods. The creators of Daily Booth launch a great new photo sharing app called Batch. The buzz about this app is off the charts. The St. Louis Cardinals win the 2011 World Series. Game 6 will be remembered as one of the greatest World Series games ever. The 49ers defeat the Cleveland Browns and are 6-1 for the first time since 1998. Buster Posey is swinging the bat in Arizona. Hank Schulman (SF Chronicle) writes about his recovery here. 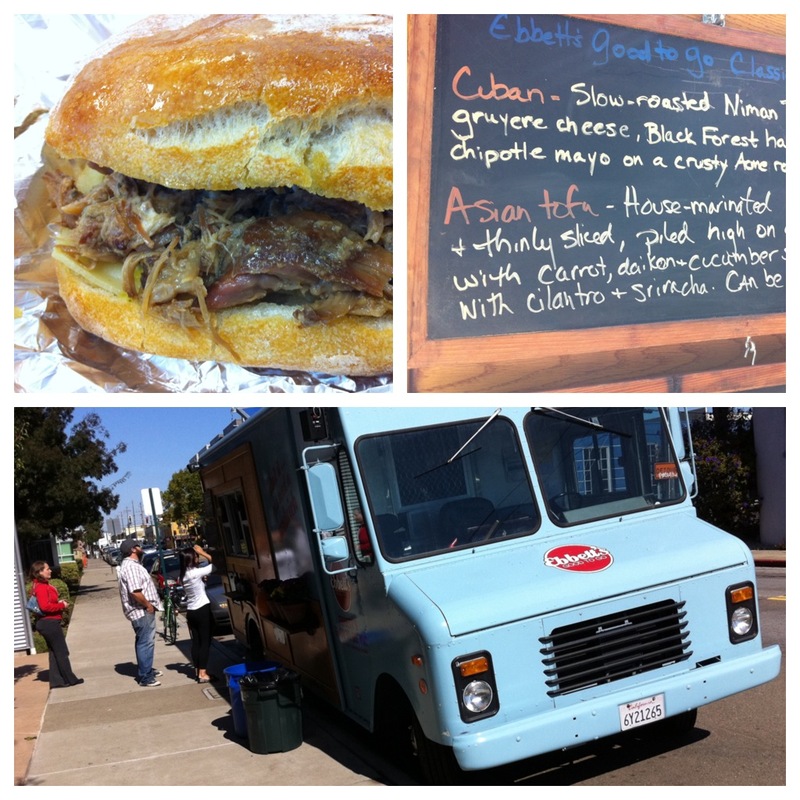 Every week or two, I’m featuring a Bay Area food truck on this blog. This week, I picked one of my favorites: Ebbett’s Good To Go. Ebbett’s specializes in sandwiches. Great sandwiches. They’re best known for their Cuban Sandwich (my favorite), but they always have two or three other sandwiches on the menu: Asian Tofu, Short Rib, Grilled Cheese. Lately, they’ve been hitting these locations: Emeryville (64th & Hollis or 2100 Powell), 21st & Webster in Oakland, and various locations in San Francisco: Truck Stop SF (Mission St. between 1st & Fremont), Hawthorne Plaza, and Civic Center. You can find their schedule on their Twitter page, Facebook page, or head over to their web site. A couple of weeks after his death, Steve Jobs continues to be a huge topic. On Wednesday, Apple celebrated the life of Steve Jobs at the Apple campus in Cupertino. Apple has posted a video recording of the celebration on the Apple.com web site. 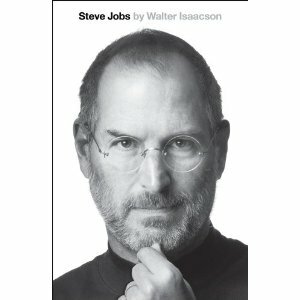 The biography of Steve Jobs by Walter Isaacson was released on October 24th. More 60 Minutes videos: Part 2, The Steve Jobs Family Photo Album, What Did Steve Jobs Say About His Rivals? Lots of speculation out there about the final project(s) that Steve Jobs was working on. Apple reported their 4th quarter earnings. For the first time in a long time, they fell short of analysts’ estimates because they didn’t release a new iPhone in June. But Apple predicts a blow-out 4th quarter and MG Siegler says you’re an idiot if you were one of the many people who sold Apple stock. The Web 2.0 Summit was held in San Francisco. Videos: Sean Parker, Sergey Brin (Google), Marc Benioff (Salesforce), Kevin Rose (Milk), Dennis Crowley (FourSquare). More videos here. Albert Pujols hit 3 home runs in Game 3 of the World Series. Reggie Jackson and Babe Ruth (twice!) are the only other players to accomplish that. The iPhone 4S went on sale on October 14th. Despite lukewarm reaction to the announcement of the 4S, initial sales number appear to be very healthy. As usual, people were lined up at Apple Stores. Pre-order sales were very strong – over one million pre-order units in the first 24 hours – and AT&T’s activation servers were overloaded when everyone tried to activate their phones at the same time. Some analysts predict that Apple will sell 4 million phones over the weekend and another analyst estimates that Apple will sell 24 million iPhones in Q4 2011. Apple stock closed at an all-time high ($422 a share) on Friday. Reviews of the iPhone 4S were very positive, especially for the new Siri personal assistant. Speech recognition. Crazy good, transformative, category-redefining speech recognition. People are having a lot of fun with Siri. A few days before the iPhone 4S went on sale, iOS 5 was released. There are some issues with apps that store content for offline viewing. This post by the creator of Instapaper goes into details. Hipstamatic will release an app that simulates the disposable camera experience. You can’t view the photos until you finish the roll. You wouldn’t know if from their Twitter or Facebook accounts, but Suppenkuche Biergarten in Hayes Valley is open for business. In This City SF has details. I’ve become a big fan of the Bay Area food truck scene over the past couple of years. 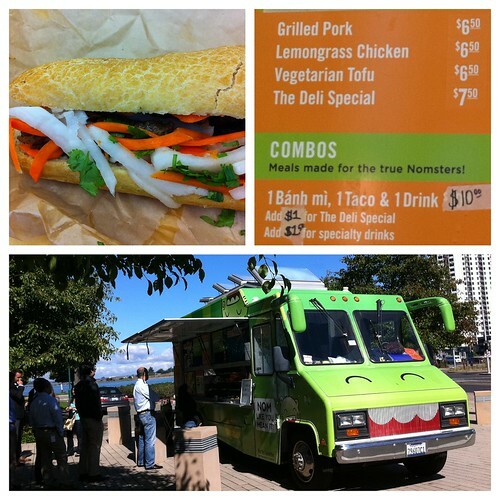 Earlier today, I had a chance to try the Nom Nom Truck when they made a stop near where I work in Emeryville. Nom Nom Truck got a lot of attention when their original, Los Angeles based truck was a finalist on the first season of Bravo’s Great Food Truck Race. They sepcialize in Banh mi sandwiches. Today, they were serving four versions: grilled pork, lemongrass chicken, vegetarian tofu, and one they call the Deli Special. I had the grilled pork and it was outstanding. You can check Nom Nom’s schedule on their Twitter or Facebook pages or head over to their web site. For a complete review of this food truck, check out the this post from the excellent I Left My Cart in San Francisco blog.